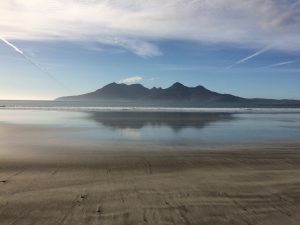 Two things stay with me about Eigg after my first visit there. Up in the north-west, Laig Bay gilds the foreground as you look out from the single-track road; it draws the eye. A wide, flat beach, white-gold dulled with tiny grains of grey as if granite had been finely ground and mixed with the sand. Little breakers drift in making a rim of pale froth. Beyond the bay, lift your eyes to the Cuillins of Rum with their perfectly rounded peaks, parabolas rising from the sea. A kind evening light softens them so that they seem to be made not of rock but of velvet. I walk down the track to the shore to take in the space and feel the sea breeze. The sand is startlingly smooth, like a wall in the hands of a master plasterer, a final sweep of water on the trowel has made the surface glisten. One other pair of feet have marked the strand; maybe it was the plasterer but he or she is no longer there. I step slowly along, adding my footprints to the others all the way to where a wide stream interrupts the beach, banked with boulders and rocks, the water too deep to cross without risking my boots being submerged. I walk back again. Three sets of footprints now. By morning they’ll all be washed away, a clean slate for tomorrow’s journeys and thoughts to be marked down in the sand. That evening, it was Thursday and the day I arrived on Eigg, this was the view of Laig Bay with Rum set out before me, its reflection captured in the wet sand, the vapour trails providing a frame. Such sweet timing. Lovely photo, Liz, and I really enjoyed your take on such a beautiful corner of the world.